VAL DI FIEMME, Italy (Feb. 28) Liz Stephen (E. Montpelier, Vt.) and Jessie Diggins (Afton, Minn.) skied powerful skating legs to lead the U.S. Ski Team to a best-ever fourth-place finish in the women’s cross-country relay at the FIS Nordic World Ski Championships in Val di Fiemme. Skiing anchor, Diggins dug deep to pass Finland for fourth in the final few hundred meters. Norway ran away with the gold its third straight at Olympics or World Championships with a 26-second win over Sweden. Russia came from behind on the final lap to take bronze. The U.S. women had been ninth in the event two years ago in Oslo. The best previous U.S. finish in an Olympics or World Championships was a fifth for the men at the 2002 Olympics in Salt Lake City. "We hoped for a medal today but fourth feels like a medal to me today," Stephen said after the race. "Everyone skied their heart out today. Jessie could have easily decided that fifth was good enough. But on that last climb she decided ‘I’m getting fourth,’ and to me that’s a medal." In the opening classic leg, Heidi Weng broke out of the lead pack on the final climb to boost Norway into the lead over France and Russia. Sadie Bjornsen (Winthrop, Wash.) kept the USA in the chase pack finishing sixth, 33 seconds behind Norway and 23 out of the medals. 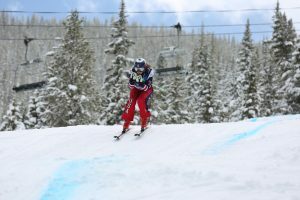 In the second classic leg, Kikkan Randall (Anchorage) brought the USA into contact with the bronze medal battle at the midway point before dropping back on the second lap to finish ninth 1:18.9 out of the lead. Stephen showed her strength on the hills of Val di Fiemme, opened the skating legs with a stellar performance to move up to fourth, handing off just 25 seconds out of bronze. On the anchor leg, Marit Bjoergen extended Norway’s lead easily over Charlotte Kalla of Sweden, leaving a battle for third between Finland, USA and Russia. The 2014 Olympic hosts came from behind to take bronze with Diggins skiing a strong leg to finish fourth. "Initially I was so disappointed in myself for losing the medal because we were catching on," Diggins said. "It was really hard to not be able to stay with the Russian but I tried my best and I have to be satisfied with that I couldn’t have pushed any harder."